Sarah Tavel / Adventurista: Why aren’t there more women in startups? Some new data. Why aren’t there more women in startups? Some new data. It’s become a common question: Why aren’t there more women in venture funded startups? I speak to venture backed startups all the time. 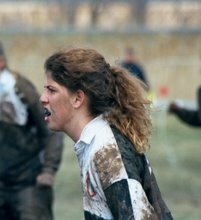 Unfortunately, more often than not, I don’t see a single female on the executive team roster. Over time, I’ve developed a hypothesis. For some reason, in the rare occurrence when I speak to a female CEO, it’s felt to me that I’m much more likely to find another female face on the company roster. It got me curious: Is this true? Are there actually more female executives in female-CEO led companies than male-led companies? If so, there are a number of implications. To answer this question, Christine and I have done some good ole fashioned data collecting. Unfortunately, this has been a much more time consuming task than we had expected, so we’ve only gone through the US portfolio of three VCs: Accel, my firm Bessemer, and Sequoia (210 companies in total). It is *not* statistically significant. 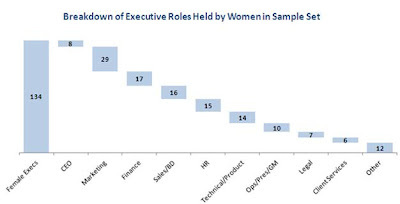 There were only eight female CEOs in the sample set. It is *not* a complete data set. 210 companies out of several thousand. Christine and I originally pulled this data Sept-Oct 09, so some of it may already be out of date. Also note: I only counted VP and higher level executives and I excluded companies that didn’t list their executives team on their website *and* didn’t have a LinkedIn profile for the company (i.e. I couldn’t get accurate data). I also excluded companies that only had one executive (the CEO) for the obvious reason they haven’t hired any executives. Given all those caveats, why publish the data? I can’t help but think this is an interesting dataset to understand, and the initial results are intriguing enough that I think it is worth trying to get more data. That said, Christine and I just can’t do it ourselves. So this blog post is actually a plea for help: I’m posting the data set in Google Docs here. It’s read-only for everyone, but if you’re interested in contributing to the document, please email me and I’ll invite you. Okay, okay. It’s not complete. You get it. So what did I find in the intial sample? There were 1219 male executives (90% of sample) vs. 134 female executives (10% of sample). 125 of the 210 companies (60%) did not have a single female on the executive team. 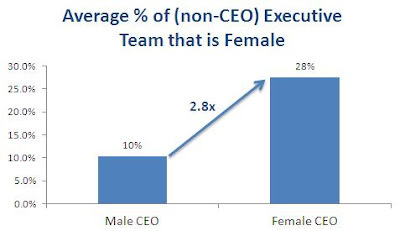 Now the money question: In male-led vs. female-led companies, if we exclude the CEOs in both cases, what percentage of the executive team is female on average? If this turns out to be directionally correct, there are a number of repercussions. But in the absence of a more complete data set, I'm reserving judgment for now. If you're interested in helping flesh out the data set, please drop me a line!